Kids.exploring.on.the.net offers fun activities and reviews of educational Web sites on topics of wide interest to teachers and students. Pick a topic and you'll find Internet resources here! Kids.exploring.on.the.net, written by Diane Sylvester and illustrated by Kathy Parks, is an invaluable sourcebook for teachers who use the Internet in the classroom. 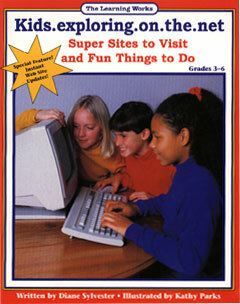 In addition, it will guide students who are new to the World Wide Web -- and those who are experienced surfers too! "Don't flame (openly argue) or carry on a heated debate." "Do not send something over the Internet that is private -- it may not be." "Capitalizing sentences or entire paragraphs is the Internet equivalent of shouting and is considered rude. Use capitals to emphasize an important word or phrase, or use asterisks to set off the important word or phrase." Explanations of concepts are straightforward yet complete. 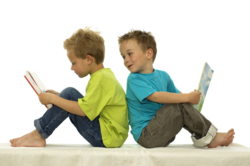 Younger children might need some help from an adult with some concepts. Family Fun -- This chapter includes sections on celebrations, nutrition, sports, exploring our National Parks, family pets, zoos, and gardens. Homework Helpers -- This chapter includes sections that highlight great sites for putting together science fair projects or school reports on states and countries; sites related to reading and writing, current events, Native American cultures, and American history and government; and great "reference library" sites that everybody should know about. The Amazing and Unusual -- This chapter includes sections about volcanoes, pyramids and mummies, pirates, bats, and whales; and two additional sections called "Catastrophes!" and "Wild and Wacky." Each section would be very useful to a student writing a report for school or just exploring a subject area for fun. The sections contain a handful of URLs, with their contents briefly described, as well as "Fun and Creative Things To Do On and Off the Internet" activity lists. But URLs are always changing, you say? Not a problem! Kids.exploring.on.the.net has its own Web page where URLs for highlighted sites are regularly updated! That way, the book remains as useful next year as it is this week! Projects on Native American culture, geography, and history will be easier to do with Native Web. Under "Subject Categories" you can find links for art, dictionaries, education, languages, literature, music, and more. "Geographic Regions" takes you to Web sites for indigenous peoples of Africa, the Arctic, Asia, Europe, Latin America, the Middle East, North America, Oceania, and Russia. There are more than 60 links to tribes and nations under "Nations/Peoples," and in "Languages" you can learn about many languages (and even listen to sounds and words on some sites). There are links to sites for teachers and students, a "Native Events Calendar," and information on "Tracing Your Roots." That brief description offers most readers (teachers or students) enough information to decide whether the site will be interesting and useful to them. If you want a different kind of site, there are always several others listed, with descriptions similar to the one above. Estimate the number of living languages spoken in the United States. Then go to the Web site Living Languages of the Americas at https://www.ethnologue.com/region/Americas. How many languages are on this Web site? Are you able to speak any of the languages listed? List the languages spoken in your state. Use the sites in this section to find examples of Native American Art, such as "Shawnee War Dance," by Ernest Spybuck. Choose your favorite work of art. In a short paragraph, explain what you have learned from studying that artwork. Compare the Native American work of art with the work of a famous European artist. How are they similar? Does the work of the European artist reflect his or her culture in the way that the work of the Native American artist reflects his or her culture? Using graph paper, create a word search puzzle using 20 of the tribal names that are mentioned in Web sites listed in this section. On a large piece of art paper, draw what it would be like to take part in a powwow. Include as many cultural traditions as you can. Make the costumes authentic by referring to pictures in the Native American Dancing Web site at http://www.scsn.net or to illustrations in other reference sources. The most useful and appealing aspect of Kids.exploring.on.the.net is the collection of diverse sites. In the science fair projects section, for example, ten Cool Science Sites are provided, in addition to eight other sites. Among the science sites are 4,000 Years of Women in Science (http://crux.astr.ua.edu/4000WS), which tells about female inventors, scholars, mathematicians, and astronomers. In the zoo section of the book, one of the sites is Welcome to the National Zoo (https://www.si.edu/natzoo), in itself a science source, which offers zoo highlights, zoo news, and animal photos, among other features. Another nice quality of the book is the way it inspires further creativity. As teachers or parents choose sites and activities for children, ideas for other equally "Fun and Creative Things To Do On and Off the Internet" will spring to mind. Readers may develop an online or offline notebook with lists of sites they have discovered and new activities they have developed as an enhancement to Kids.exploring.on.the.net. Kids.exploring.on.the.net is written by Diane Sylvester and illustrated by Kathy Parks and published by The Learning Works, Inc. (Santa Barbara, Calif., 1998). The Learning Works' catalog includes many teaching resources worth checking out. For a catalog of across-the-curriculum products from The Learning Works, call 1-800-235-5767, or check out their Web site at https://www.creativeteaching.com/. Paving the Way to Internet Safety!